The above statements, from students identified with a learning disability (LD) under the rules of the Individuals with Disabilities Education Act (IDEA), make it clear that these students do not consider themselves writers or enjoy writing. Unfortunately, research backs up their thinking. Studies have consistently shown that students with LD, who are identified by school personnel due to lack of academic progress, struggle in all areas of the writing process. This results in writing that is not as clear, detailed or coherent than that of their peers, as well as grammatically incorrect and unorganized. These students often struggle with executive functioning skills such as goal setting, planning, and self-regulation that are needed when executing the many processes involved in writing. Teachers often say that they do not feel prepared to teach students who struggle with writing and that they have received little training in the teaching of writing altogether. As a result instruction is often inadequate, grading is based on narrow rubrics that focus on structure and mechanics, and all parties are frustrated with the learning process. As a fifth grade teacher, I encountered students who, after years of discouragement, were ready to give up on writing. By this time in their school experience, they were over focused on the mechanical requirements of writing, such as handwriting and grammar, and they had little energy left for creativity or storytelling – the fun parts of writing. Later, teaching in a resource classroom, I found that even with individual support, students with LD produced writing that did not meet school expectations or avoided the task when possible. To them writing was an overwhelming physical and cognitive task, which they did not enjoy after years of repeatedly receiving low grades and little positive response to their ideas. As a researcher, I have begun to ask students with LD about their writing at home. Most students claim they rarely write at home. However, when I ask about using social media, they usually have a lot to say! For example, an eighth grade student with LD described writing on Instagram about recent school shootings. He used writing to express sympathy and to share opinions about gun control issues. A sixth grade student with LD talked about writing and reading stories using a “funny” voice that made people laugh and about using Snapchat to share humorous pictures and captions. The irony in these cases is that the same students who say they don’t like to write, often write at home alone or with friends using digital apps. Time spent on social media represents hours of practice in authentic communication situations. Students not only practice transforming thoughts to text, the more traditional type of writing, but also use images, video, and sound to share ideas, much in the way that they will be communicating in their future workplaces. Having an authentic audience, whether peers or relatives with whom they are communicating, gives students practice adjusting their writing to a specific purpose. They are using these sophisticated skills in their social media lives, but in many cases the skills are not transferring to their writing at school. When teachers realize that writing done outside of classroom contexts counts, they can begin to harness these positive writing experiences and to help students see themselves as writers. Recently, I spent time in the classroom with Mr. M., a teacher committed to providing his eighth grade students with opportunities to use digital technology while writing. I saw students with LD writing captions on a digital storyboard as a response to their reading. Another day, students took part in a digital conversation about an ethical question using Padlet, an online digital bulletin board. When I talked to the students about these activities, in contrast to the quotes at the beginning of this post, the conversation was overwhelmingly positive. This student is using an online graphic organizer in Popplet to categorize her ideas before beginning to write. These students are telling us that they are able to write and enjoy writing using digital tools. These tools allow them to expand the idea of writing from a text-based process to a multi-modal process often expanding on strengths that the students possess. Teachers can build on the students’ use of digital media at home by introducing digital learning tools into the writing process. 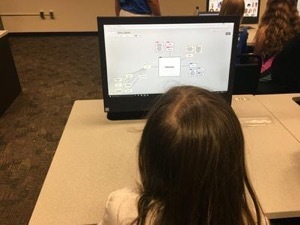 For example, planning tools such as Popplet, in the image above, aid in planning and outlining: important parts of the writing process at which these students often struggle. Students with LD who struggle with writing can thrive and create masterpieces when assigned to create multi-modal tall tales or other pieces that use GarageBand software. The skills students are using when creating multi-modal pieces as they learn to design, create, and present are vital for success in the 21st century. In spite of having a label of LD, with the proper tools and support, students were able to learn, stimulate their creativity and express their ideas to a meaningful audience increasing their motivation to write. Mr. M. said that he began using digital technology slowly, matching the tools used to specific standards that he is required to teach, such as crafting an argument. The use of digital technology has allowed him to get more done in his classroom and his students tend to stay on task more when they do this kind of work. He enjoys the variety of ways that students can respond to material using the laptops in his classroom. Most of all, he is happy that students enjoy writing and make fewer complaints when writing digitally. For students with learning disabilities, 21st century digital tools hold great promise. These tools can help students and their teachers shift their thinking away from writing as a laborious of process of putting words on paper for a teacher’s eyes only and toward a vision of writing to share ideas, express creativity, get a point across, and solve problems. With this shift, students begin to think of themselves as writers and writing experiences may become more fruitful and successful. Students create a visual layout of their writing piece. Can be used to prepare to write a story or create a movie or as its own publication. Helps students with visualization, planning, organizing and sequencing. Turner, K. H., & Hicks, T. (2016). Argument in the real world: Teaching adolescents to read and write digital texts. Heinemann. April Whitehurst is a doctoral student in Specialized Education Services at the University of North Carolina at Greensboro. She studies the writing experiences of students with learning disabilities.